As the symbol of protein excellence, we did not want to limit Nectar® to only fruit juice flavors. We therefore researched long and hard to find other beverage flavors that would be perfectly compatible with the high-quality standards that Nectar® has achieved. After much experimentation and discovery, we developed Nectar® Lattes. Caramel Macchiato, Vanilla Latte and the original decaf Cappuccino highlight the perfect success we had in creating these coffee-flavored protein powders. With all of the taste characteristics of a barista-made coffee and with no off-note flavors, Nectar® Lattes is sure to please the most discriminating coffee drinker. 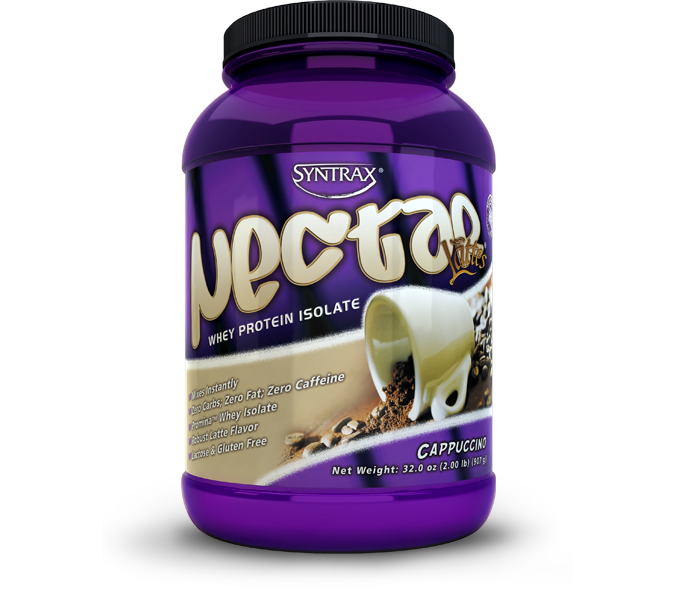 Nectar® Lattes is a whey protein isolate powder that has the taste and sensory characteristics of the perfect latte or coffee drink. Although more expensive than protein concentrates, protein isolates are a minimum of 90% protein and have zero fat and zero carbohydrates. They are considered the luxury proteins and have a refined taste and color profile. Promina™ brand whey protein is the only protein source used in Nectar® Lattes because of its superior neutral taste, solubility, and mouthfeel. First, Nectar® Lattes contains the purest whey protein ever created. It is snow white without the usual protein aftertaste associated with most whey proteins. Second, the flavors are engineered specifically so that Nectar® Lattes has no protein off-notes or aftertastes. Only the taste of fresh coffee is noticeable. The sweetness comes from the precise blend of two high intensity, non-nutritive sweeteners. This is based on taste preference. Nectar® Lattes tastes delicious in 8–16 ounces of water or milk per full scoop. We recommend to start with 8 ounces of water or milk. If it tastes too strong, then dilute it/weaken it with an appropriate amount of water or milk. Absolutely! Nectar® Lattes is delicious either hot or cold. Warning: if overheated, the whey protein in Nectar® Lattes will denature and curdle. For best results, heat a full scoop of Nectar® Lattes in 8 ounces of water or milk for about 40 seconds. Nectar® Lattes Caramel Macchiato and Vanilla Latte each contain 100mg of caffeine per full scoop, which is the about same amount in a typical cup of coffee. Our Nectar® Lattes Cappuccino is caffeine free.